The Walking Dead returns to your screens with twice as many episodes as last year — and it sounds as though the road is going to be a very dangerous place this time around. Meanwhile, Malcolm McDowell and Faran Tahir both have some pretty bizarre cameos. The Matrix may provide the key to a major mystery on Fringe. Plus check out some brand new clips from this week's episodes of Terra Nova, Star Wars: The Clone Wars, Fringe and more! Susan and Mary discover Gil's a fan of the latest teenage vampire saga, so they transform into vampires to get his attention. Johnny and Dukey turn vampire hunter to rescue Gil and turn Johnny's sisters back to normal. "Creepy Doll" – Mordecai and Rigby discover an old Victorian Doll that Pop's has not played with or seen since he was a child and unwittingly unleash its pent up rage against him. "Death Metal Crash Pit" – Muscle Man and High Five Ghost want to crash an old RV into a pit, but it's haunted by a 80s death metal band. "In the House" – Rigby eggs the wrong house that's owned by a vengeful wizard. Check out a clip above. Then at 8:30 PM, Cartoon Network has another episode of Secret Mountain Fort Awesome, followed by a new Mad at 8:45 PM. Yes, it's the "memory loss virus" episode. Maybe it'll be this show's version of the all-important "Naked Time"/"Naked Now" episode. Check out a sneak peek! At 8:30, Nickelodeon has a new episode of Supah Ninjas, featuring George Takei as a holographic grandpa. And at 9:00 PM, Nicktoons has a new episode of Dragon Ball Z Kai, "The Tables Are Turned! Witness the Power of Perfection!" Which is a pretty awesome episode title. Also at 9 PM: a new episode of the frequently weird-sciencey House on Fox. And then at 10 PM there's another episode of Castle on ABC, "Kick the Ballistics." But there's no Death Valley on MTV, because the channel is having a TV movie about people oversharing and being sexual on the internet, followed by a very special discussion — a topic that would have been science fiction not all that long ago, really. When a crime scene is destroyed in an explosion moments after Carrie catches a glimpse of the room, her memories become a crucial piece of the investigation. There's an all-new Mythbusters on the Discovery Channel at 9 PM, "Walk a Straight Line." Adam and Jamie explore whether humans — deprived of sight — can travel in a straight line, while Kari, Grant and Tory test whether binary explosives will explode in the case of a fender bender. At 9 PM, there's also another new Ancient Aliens on the History Channel, "Aliens and Deadly Cults." Two great tastes that go great together. Then at 10 PM, there's another helping of the psychotic American Horror Story on FX, "Home Invasion." Vivien and Violet get caught in a dangerous situation strangely similar to one from the house's past. Meanwhile, Ben returns to Boston to put an end to a dark chapter in his life. But first, he sees a patient who has nightmares about being cut in half. He also refuses to treat Tate anymore because of the teen's feelings for Violet. Another option at 10 PM: the season premiere of Psych on USA, with the provocative title, "Shawn Rescues Darth Vader." Shawn stumbles across a dead body at the British consulate's home while working a case to recover a stolen "Star Wars" collector's item. In order to get the police on the case, Shawn claims he had a vision of the murder and puts his reputation as a psychic on the line. Check out a sneak peek, featuring Macolm McDowell! A third option at 10 PM: the midseason premiere of South Park. But then at 10:30 PM, National Geographic has another Mad Scientists, "Turbo-Charged Leaf Blower." Really? That's as mad as you get? A SENIOR PRANK NIGHT TO DIE FOR - Despite all that has happened, Caroline (Candice Accola) is determined to see that Elena (Nina Dobrev), Bonnie (Kat Graham), Matt (Zach Roerig) and Tyler (Michael Trevino) all enjoy a traditional Senior Prank Night before the school year begins at Mystic Falls High School. However, when uninvited guests show up, it doesn't take long for the evening to take a deadly turn. Damon (Ian Somerhalder) convinces Jeremy (Steven R. McQueen) that he can use his new connection to the other side to help find a way to defeat Klaus (Joseph Morgan). Finally, Klaus deepens his hold on Stefan (Paul Wesley) and uses him for increasingly violent and dangerous purposes. Also at 8: another episode of Community on NBC, with the very promising title of "Remedial Chaos Theory." That's one of the best episode titles I've ever seen. Or you could also watch another new The Big Bang Theory on CBS at 8 PM, with "The Russian Rocket Reaction." Based on a teleplay from the original "Charlie's Angels" series, the girls must break out of jail in their quest to crack a case. This time, they pose as unsuspecting American tourists to crack a kidnapping ring in Cuba. Upon arrival at the hotel, they are framed and thrown into a women's prison, where their key victim, Tess, is also incarcerated. Bosley joins forces with his ex-girlfriend, CIA operative Samantha Masters (Erica Durance), but is this partnership something more? "Angels in Chains" was written by Javier Grillo-Marxuach, based on a teleplay by Robert Earll. Yes, it's the first episode written by The Middleman's creator. Sadly, it doesn't sound like it's going to be very "spy-fi." Let's hope this time around, Reese gets to beat up some cocky doctors. CASSIE IS TORN BETWEEN HER FAMILY AND THE CIRCLE - Torn between her loyalties to the Circle and her family, Cassie (Britt Robertson) wrestles with the secrets she must keep from her grandmother (Ashley Crow). Nick (Louis Hunter) is thrown for a loop when Melissa (Jessica Parker Kennedy) adopts a new attitude and enlists his help to track down her family's Book of Shadows. Faye (Phoebe Tonkin) is also recruited but isn't happy about being the third wheel. Meanwhile, Diana (Shelley Hennig) is craving some alone time with Adam (Thomas Dekker) and arranges a date night so they can rekindle the spark in their relationship, but all six of them are brought together to fight off a dark force that threatens to destroy the Circle from within. Completely unaware of the new danger encroaching on their children, Dawn (Natasha Henstridge) joins Charles (Gale Harold) aboard his boat to further their plans for the Circle, but is surprised to find that Charles may have more than business on his mind. After a team up with Space Ghost and his companions, Batman must come to the aid of three of his fellow superheroes, who have fallen into the icy clutches of Mr. Freeze. As they wait to be rescued, Green Arrow, Plastic Man, and Aquaman remember how they first met the Caped Crusader. At 8 PM, CBS has another episode of A Gifted Man, "In Case of Separation Anxiety." When Michael treats a patient who is hearing voices, he turns to Anton for help. Meanwhile, Kate's first day at the clinic doesn't go well. C-3P0 and R2-D2 encounter danger at every turn when they visit two hostile worlds and have a run-in with pirates. Check out your first sneak peek of the episode at left. NIKITA'S OLD PARTNER ESCAPES FROM PRISON - Nikita (Maggie Q) is stunned when she hears that her old Division partner Kelly (guest star Katheryn Winnick) escaped from a Turkish prison. Nikita thought Kelly died years ago and always felt responsible because it happened on the mission where Nikita escaped from Division. Knowing Amanda (Melinda Clarke) will go after Kelly, Nikita tells Michael (Shane West) they have to go to Turkey to help her. Amanda sends Alex (Lyndsy Fonseca) and Roan (guest star Rob Stewart) to Europe to stop the former partners from reuniting. Or for another alternative, Disney Channel has a brand new Wizards of Waverly Place, "Ghost Roommate." Check out a sneak peek from the episode, in which Walter tries to apply lessons from The Matrix to discovering the truth about Peter. Also at 9 PM, there's another new Supernatural on The CW, "Defending Your Life" — featuring the ubiquitous Faran Tahir! DEAN IS PUT ON TRIAL FOR HIS PAST SINS - Sam (Jared Padalecki) and Dean (Jensen Ackles) investigate a string of gruesome murders and discover the Egyptian god Osiris (guest star Faran Tahir) is behind the deaths. The vengeful god is putting people on trial for their past mistakes and killing them if found guilty. Osiris hones in on Dean's guilt and decides he's the next to stand trial. Sam steps in as Dean's lawyer, but both brothers are unprepared when Osiris calls an unexpected witness – Jo (guest star Alona Tal). Then at 10 PM, there's another episode of Sanctuary on Syfy, "Uprising". Will, Kate and Bigfoot struggle to prevent an all-out Abnormal war. Check out a sneak peek, featuring some pretty amazing political speechifying. And then at 11 PM, G4 has the first season finales of Iron Man Anime and Wolverine Anime. The Hub is showing a new episode of R.L. Stine's The Haunting Hour: The Series at 8, followed by the season finale of Transformers Prime at 8:30, "One Shall Rise: Part 3." And then at 9 PM, there's yet another new episode of Supah Ninjas on Nickelodeon. But also, BBC America has another episode of Bedlam at 9 PM, "Inmates." Sadie Novak is recovering from a breakdown, but sparks fly when she meets Jed. Ryan encounters an old woman he's seen wandering around and learns secrets of Jed's origins. At 10 PM, Comedy Central has a special, Craig Ferguson: Does This Need to be Said? Given his recent Doctor Who obsession, I wouldn't rule out a few Who jokes, or some kind of Who skit. Or cameo. Also at 9 PM, Discovery Channel has a new Curiosity, "Can You Live Forever?" And it's hosted by MythBusters' Adam Savage! 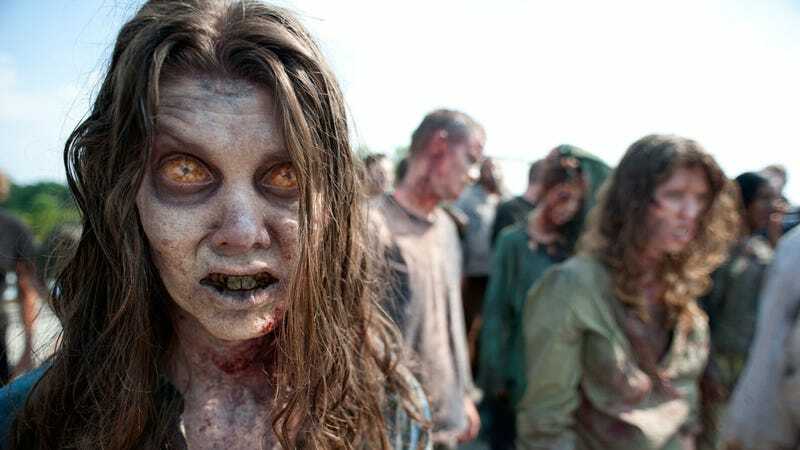 Also at midnight: the series premiere of AMC's new zombie talk show, Talking Dead. AMC announced today "Talking Dead," the network's first live after-show that serves as a platform for discussion for AMC's series, "The Walking Dead." The half-hour episodes are produced by Michael Davies' Embassy Row and are hosted by Chris Hardwick (Nerdist; G4). "Talking Dead" premieres immediately following the encore presentation of "The Walking Dead" on Sunday, October 16. Then beginning on Friday, November 4th the series follows "The Walking Dead's" encore presentation at 11 pm EST. "Talking Dead" features Hardwick spending time with fans, actors, producers and tv enthusiasts, recapping that most recent "Dead" episode, and taking questions and comments from viewers. Fans may continue to engage with the after-show following the on-air conclusion, online, at amctv.com for more conversations, questions and trivia.